With its short growing season, Minnesota presents a special challenge to gardeners who want potted flowers outdoors during frost-free weather. It is necessary to start seeds indoors as early as late January in order to have blooming flowers during the entire frost-free period from May through mid to late October. Or purchase bedding plants from garden centers when the weather warms. Annuals are the best choice for growing outdoors in pots, because the consistent below-freezing temperatures will freeze solid the soil in any outdoor pots, killing the roots of potted perennial flowers. Extensively hybridized in recent years, the petunia (Petunia hybrida) is one of the most popular annual flowers, as evidenced by pots and baskets of them scattered in urban and rural areas throughout Minnesota. Petunias do best in full sun, but will still produce an impressive floral display in partial shade. Grandiflora petunias are slightly branching plants that grow to a height of 10 to 12 inches, producing many large flowers throughout the summer months until killed by frost. Multiflora petunias are similar to grandiflora, but produce greater amounts of smaller flowers. Milliflora petunias are miniature, producing an abundance of flowers an inch in diameter. Groundcover or “spreading” petunias grow 6 inches high but spread rapidly, which makes them ideal for hanging baskets or trailing over the edge of container gardens. They can grow to a length of 3 feet during the summer season. 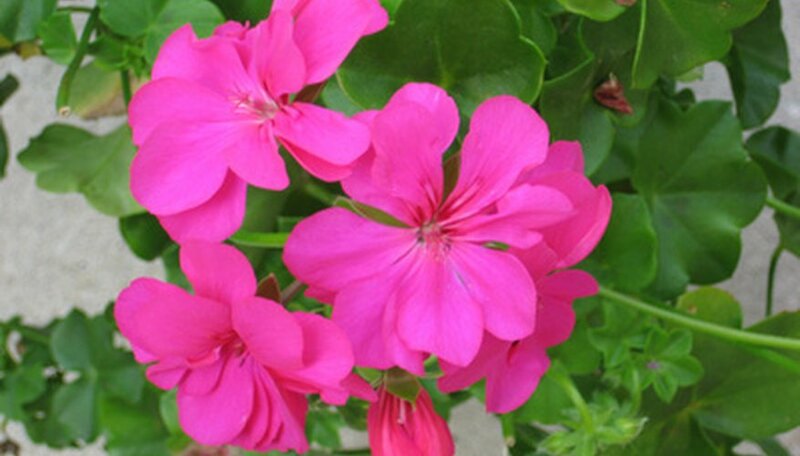 An African native that is available in a wide variety of colors, growth habits, flower and leaf shapes, geraniums (Pelargoniuim hortorum) are an ideal potted flower for growing outdoors during the unpredictable weather of Minnesota summers. Geraniums are frost tender and should not be put outdoors until all danger of frost has past. Potted geraniums may need to be watered daily during the hottest part of summer, but don't over-water them. If the soil is still moist, wait or their roots may rot from excess moisture. At the same time, it's important not to allow them to dry out and wilt, as this weakens the plants and they will produce fewer flowers. Over-fertilizing them will also cause them to produce fewer flowers. An application of slow-release, all purpose granulated fertilizer when potting them up will suffice for the entire growing season. Apply the fertilizer following the manufacturer's application rates. Geraniums can be grown indoors during winter in a sunny, south-facing window and brought back outdoors when all danger of frost has past. Although it is a wide-ranging species, the variety most commonly grown in home gardens in the United States is Impatiens wallerana (formerly Impatiens sultanii). It is a perennial in its native East Africa and grown as an annual in temperate zones. Impatiens have become more popular since hybridizing began in the 1960s, which resulted in plants that bloom all season and seeds that reliably produce plants of a consistent size and growth habit. Flower colors range from white to cream, to all shades of pink, rose, peach, orange, red and even bi-colors. Impatiens are a shade-loving plant, and are widely grown in Minnesota in hanging baskets in the shade of porches, patios and containers placed in the shade of deciduous trees. Check potted impatiens often and water as needed to keep their soil relatively moist.